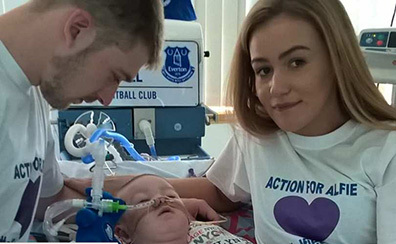 As NRL News Today reported on Tuesday, the ventilator keeping grievously ill Alfie Evans alive could be turned off as early as Friday. However in an impromptu press conference outside the Queens Building in the Royal Courts of Justice in London, his father, Tom Evans, said the battle “isn’t over, this is just the start” moments after Mr. Justice Hayden ruled in favor of Alder Hey Hospital which wishes to turn Alfie’s ventilator off. But an eleventh-hour legal appeal would be costly for Evans and Kate James, Alfie’s mother. And then, out of the blue, on Wednesday, Bill Kenwright, the owner of the Everton Football [soccer] Club and a theatre producer, donated a large, undisclosed amount towards meeting the £10,000 (roughly $14,000) fee needed to fund a legal appeal, according to Tom Belger of the Liverpool Echo. Supporters of the Alfie’s Army movement tonight on Facebook urged people to donate £10,000 needed to fund a legal appeal. And within hours of the post they reached their target partly thanks to a huge undisclosed donation from the Everton chairman. “The continued provision of ventilation, in circumstances which I am persuaded are futile, now compromises Alfie’s future dignity and fails to respect his autonomy. Alfie, who is 21 months old, has been at the hospital since December 2016 with a condition that defies a definitive diagnosis. All through the seven-day-long hearing, Evans, who served as his own attorney, vigorously challenged the hospital’s conclusions that treatment was futile and offered counter-examples that Alfie was responsive.